Obsession with any item comes from within. For example, if someone were to fall in love with classic cars, we shouldn’t be asking them “why?”, “when?”, or “how?” Love just tends to happen. Speaking of obsessing over classic cars, we are here to tell you to fasten your seat belts, ladies and gentlemen, and get ready to drive Friday away with one cool experience. 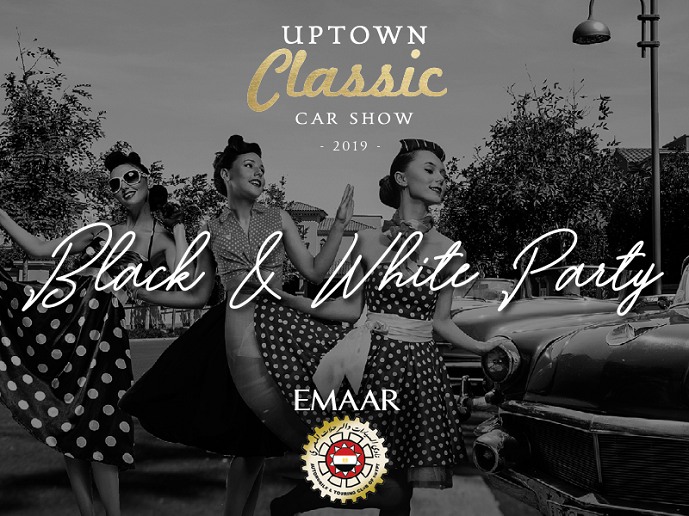 The well-known developer – Emaar Misr – is going to throw a signature black and white themed classic car show at Uptown Cairo this Friday (April 12th)! You’ll get the chance to meet up with your fellow buddies, and drool over the beauty of vintage automobiles such as Rolls Royce, Cadillac, Mustang, Camaro, Mercedes, Jaguar, and many more. The day is set to start at 3 pm, with an array of car shows of various antiquated vehicles. Throughout the day, you’ll get to taste a wide range of delicious treats from different caterers. Also, a live performance will be taking place, along with an antique bazaar that will fill your soul with vintage shopping therapy! At the event finale, a classic cars parade will take place around two laps. Our birdies also tell us that the parade will include a marching band and mood dancers grooving all day alongside the cars. You can also have a chat with the cars’ owners, and ask them everything you want about their gorgeous vintage vehicles. Intrigued by the fascinating program? Hurry up, ladies and gents and make sure to get your invitation to this prestigious event. You can do that through sending a private message on Emaar Misr’s official Facebook Page here. Also, make sure to dress smart casual! Terms and conditions apply, and priority will be given to Emaar homeowners and their guests, but of course, you’re all welcome. You can also check out the event’s details on Facebook. It looks like it’s about time for some good old fashioned nostalgia, and what better way to experience nostalgia than by paying one of Egypt’s most pristine communities a visit?